Moving all three garlic vines (my own 2 vines and the mall-bought plant) to the front wall of the house was a good idea, I concluded. 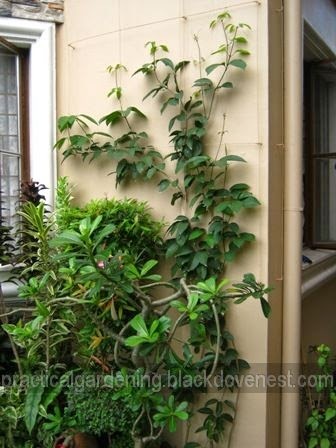 The Princess vine at the side wall has become bigger and thicker that its branches were entangling with the garlic vines'. It was a mess, to say the least. Training the branches of both vines to keep them apart has become so tedious that I was already contented just whacking and pruning them away to keep the wall neat. Also, this front wall of the house gets afternoon sunlight year round. Compare that to the old side wall where the vines only had sunlight in the summer months. Here are the three vines climbing up the wall vine support with the rectangular-pattern. In this new location, all three vines grew even much faster and quickly became vigorous. They were growing fast and tall that I had to climb a ladder just to keep their height in check. Otherwise, they'd become lanky, climbing all over the wall and drooping in parts of the wall that had no vertical vine support. I did this pruning while up on the ladder almost every month. But the sad part of it all was that none of the vines were yielding flowers. I was ready to give up on the garlic vines, but then wanted to try another different location - a place that received even more sunlight. This time it would be at our front fence. This corner of our front fence essentially gets 8 to 10 hours of sunlight everyday, throughout the year. So in June 2012, I transferred all three vines from the house's front wall to the front fence. In addition, I included the other two non-flowering garlic vines we had at the backyard. So that's a total of five garlic vines all in that corner of the front fence. Here are the relocated garlic vines in their third location. This would be the last straw I thought. I suspected that the garlic vines just needed more sunlight. I had nothing to lose. This is one area on the property that receives the most sunlight. If after a year or two, they STILL wouldn't flower, then I'm ready to pull them all out. This is a prime spot and I'd rather have flowering vines where space is a premium. If, however, this proves to be a sweet spot for flowering, then I'd be naturally be rewarded with plenty of blooms. After all, I have five mature vines ready to yield flowers - all of them in that spot. In this third location, I nurtured the vines in the best way I can. I watered it regularly - twice in the hot summer months. I fed it with organic fertilizer like aged horse manure that we were able to get from a local horse racing track and cow manure which we shoveled from the stables of a local agricultural university. But the organic fertilizer I fed it on a routine basis was homemade fish emulsion fertilizer. This third location did not let me down. In the following year, by August 2013, the first flower bud appeared. I was ecstatic! In the next month, flowers in clusters started to appear as shown in the photo below. The colors of the garlic vine flowers provided a nice contrast with that of the Maiden's Jealousy vine or Shower of Gold climber (Tristellateia australasiae) that shares space in the front fence. And in October 2013, a second wave of flower clusters appeared, but now in the other longer branches. The photo below shows the vines at the other side of the front fence. It's difficult to say how this second wave of flowering came about. My theory is that since there were five vines planted in that spot, the vines flowered at different times and not all at the same time. How lovely.I read through all your posts. Such detail. Love reading them.I have a large size pot of these I keep in my bedroom balcony. But it's facing the west. So they arent getting too much sun. I want them to fill the railing. I can't wait for it to flower again.